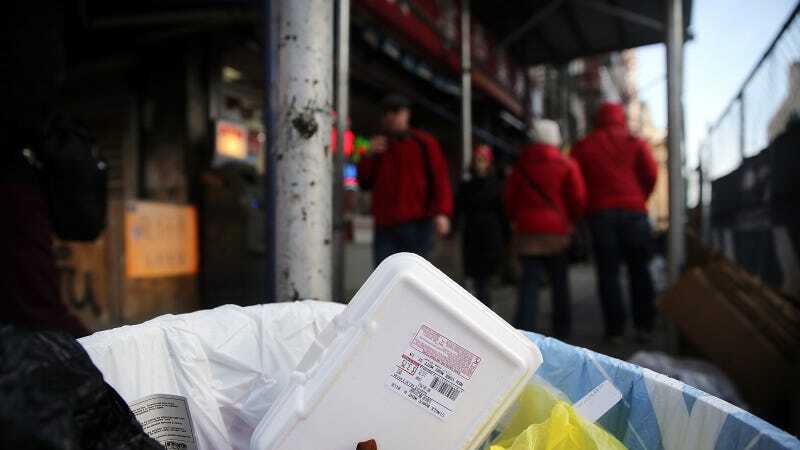 In a surprise decision, a New York City judge has struck down one of Mayor Bill de Blasio's major environmental initiatives: a ban on polystyrene foam, commonly referred to in its trademarked form Styrofoam, MSNBC reports. The ban, which went into effect in July, made New York the largest city to outlaw the sale, possession, or distribution of single-use clamshell containers, cups, packing peanuts, and more. The Associated Press notes that former Mayor Michael Bloomberg supported the ban and that de Blasio put it into effect on July 1st. “These products cause real environmental harm and have no place in New York City,” de Blasio said at the time, per Pix11. Manhattan Supreme Court Justice Margaret Chan said that the ban was excessive (violators were subject to "steeper fines than those for marijuana offenses") because the material can be recycled, despite what sanitation commissioner Kathryn Garcia says. “The Commissioner’s concern is not justified given abundant evidence showing a viable and growing market for not just clean EPS (expanded polystyrene foam) but post consumer EPS material,” Chan wrote in her decision, a major victory for the foam industry. The city is already planning to appeal the decision, saying that the foam cannot be recycled profitably. MSNBC notes that the average New Yorker contributes about six pounds-worth of polystyrene foam to the city's trash every year. The movement to overturn the ban was headed up by a company called Dart Container, who teamed up with the restaurant owners groups, claiming the ban was “capricious,” “irrational,” and “arbitrary.” (You may recognize this argument from an episode of Seinfeld.) Dart, you won't be surprised to learn, produces styrofoam cups, containers, and dinnerware for both restaurants and consumers. They said the ban would place unreasonable burdens on food sellers who would need to use compostable paper containers, which are also more expensive, making your General Tso's cost more, too. The city, meanwhile, has continued to point to Leith Hill, the owner of Ellary's Greens, an all-natural cafe. She told The Villager in 2014 businesses would continue to use the foam containers because they are so much cheaper. “It’s so much more expensive to do the right thing,” she told the paper, citing the fact compostable containers cost about 8x as much as foam ones. But earlier this year she told MSNBC that this was not as much of a problem because as more and more business started adhering to the ban, the prices on compostable containers began to drop. The responses on social media were mixed. It's not yet clear whether Chan's decision will lead to similar action in cities, like Washington D.C., San Francisco, and Portland, where bans remain on the books.